Silence followed, at least for a few seconds. Perhaps a grunt, or a “hmmm,” or an uncertain glance to one side. They have cooking to do, and customers to take care of. What is it I wanted to talk about it? Why? I ought to come by and spell it out, and then they would decide about the interview. When I moved back to Mississippi, my home state, after 15 years living across the country, I realized that most convenience stores were not just convenience stores. 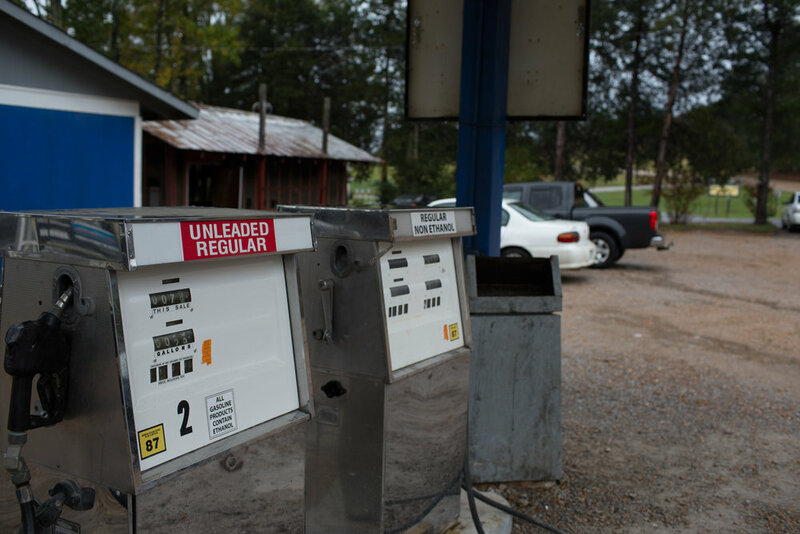 While gas pumps flowed regular and diesel outside, inside they sold tackle boxes and camouflage baseball caps, life preservers and insecticides. More importantly, they sold real food – not just packaged – prepared by actual cooks, every day. And when people came by to eat, they didn’t just grab a sandwich to go. Instead, they sat, sometimes alone and sometimes in pairs or small groups, and stayed a while to visit among rows of fishing line spools, cleaning supplies, and beef jerky pouches. Maybe I had known this as a kid, but I never saw it the way only time and distance can teach you about the place where you grew up. I wanted to know more – about the food and the people who cooked it, and the communities these spaces foster. The problem was that no one seemed eager to tell me; they couldn’t find the time, or weren’t sure about a recorded interview. I felt shy asking, and their reluctance didn’t boost my confidence. That’s another thing about small-town Mississippi, I began to think: people can be suspicious and slow to trust – even slower when they think you might be judging them, as I suspect they believed I was. When I said “convenience store food,” they raised their chins a little higher. Bit by bit, they opened up. Every location I asked to interview for this project agreed to give one, though not at the original times we discussed. Gene Dunn volunteered himself, while others nominated co-workers. Our conversations began slowly, with staccato responses, and eventually escalated to memories and anecdotes. Twice, the employees who had not wanted to be interviewed – who instead nominated a colleague – ended up hanging around by the table where I sat, listening and interjecting and offering stories of their own. By the end of my visit, they were asking me back for lunch. That’s the other thing about people here: they love a friendly face. 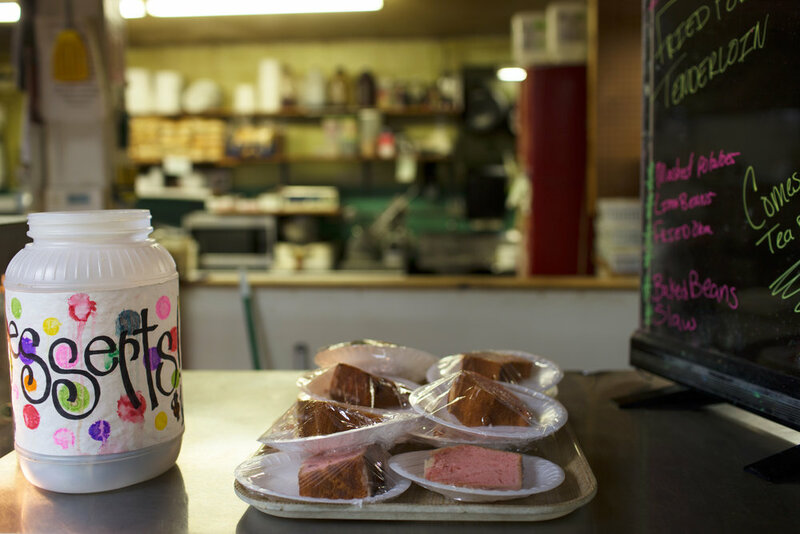 The tradition of “road food” in the South – that is, a quick bite off of a highway or rural road – has long thrived in the Southern United States, where towns tend to be spread out and most people travel in cars. Even before the advent of the automobile, when the Louisa Railroad brought employment opportunities and vitality to the small town of Gordonsville, Virginia, African American women sold fried chicken, biscuits, and fruit pies to passengers across from the station platform. As Psyche Williams-Forson describes in Building Houses Out of Chicken Legs: Black Women, Food, & Power, the women competed with taverns and other restaurants licensed to sell food, and thus “went on to purchase a better way of life for themselves and their families” (32). To this day, fried chicken is a staple of menus in gas stations and convenience stores across the South. Country stores proliferated in the late 19th century South, before chains forced many out of business. These stores offered sites where men from rural communities engaged with industrial and commercial America – where they might buy pants, sip liquor, and purchase stamps or a can of sardines (Clark xi). In the early and mid-20th century, many country stores also offered a lunch of canned pork and beans, pickled eggs, hoop cheese, and saltines, which they ate inside or out on the front steps (Mills 150). 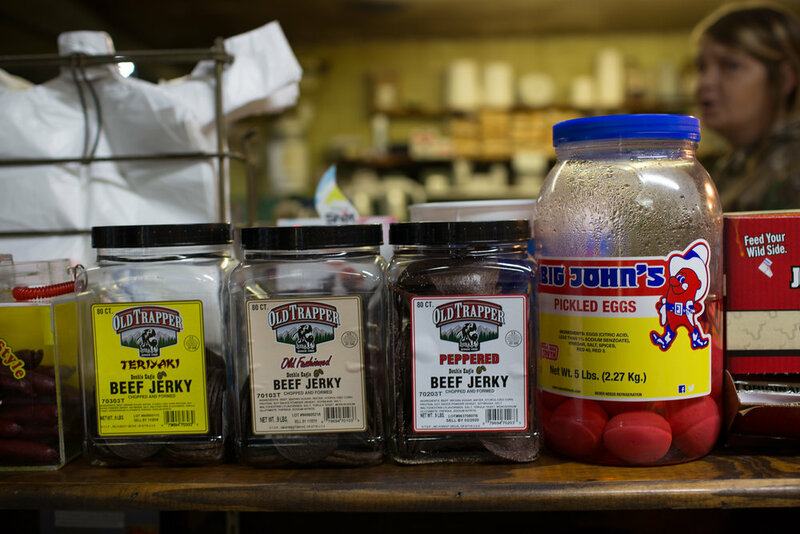 It is easy to imagine store lunches as a predecessor to today’s convenience store fare; jars of pickled eggs and pigs’ feet still stock the shelves of local Mississippi shops. What follows here is the result of a month of fieldwork conducted in November 2018. I visited three convenience stores in three different towns in North Mississippi and conducted a formal interview with a representative of each, along with informal conversations with other employees and customers. I dined at the stores, took notes about the environments and people, and made photographs of what I saw. I offer these accounts of my observations and interactions, with brief concluding thoughts about what these businesses represent for their communities today. The woman on the phone had told me to come on Friday at 1 p.m. That morning, I called to confirm, and she said 1 p.m. would be too late. Ten minutes later I was in the car, driving to Grenada. On a map the Biscuit Pit is listed as BP, which is both an abbreviation and a nod to the space’s former life as a BP gas station. It’s located off of Highway 51, adjacent to a liquor store and a check cashing service; Fred’s, Family Dollar, and Sonic Drive-In also line the road nearby. The pumps have been out of service for three years, but people still come for the food – especially the biscuits. Inside, is a small dining area, divided off from a grocery that sells chips, toilet paper, and soft drinks. In the back of the space is an open kitchen, where I can see a woman in a purple T-shirt seasoning a tray of meat. A hot buffet is mostly empty, even though it’s not quite noon, and a sign hanging overhead features a handwritten menu: a Plate Lunch for 5.99 and B-B-Q Plate for 6.99. Angie has been cooking at the Biscuit Pit for twenty years. That sounds like a long time, until I hear that her colleagues Shirley Ward and Verdie Rosemand have been here for thirty. 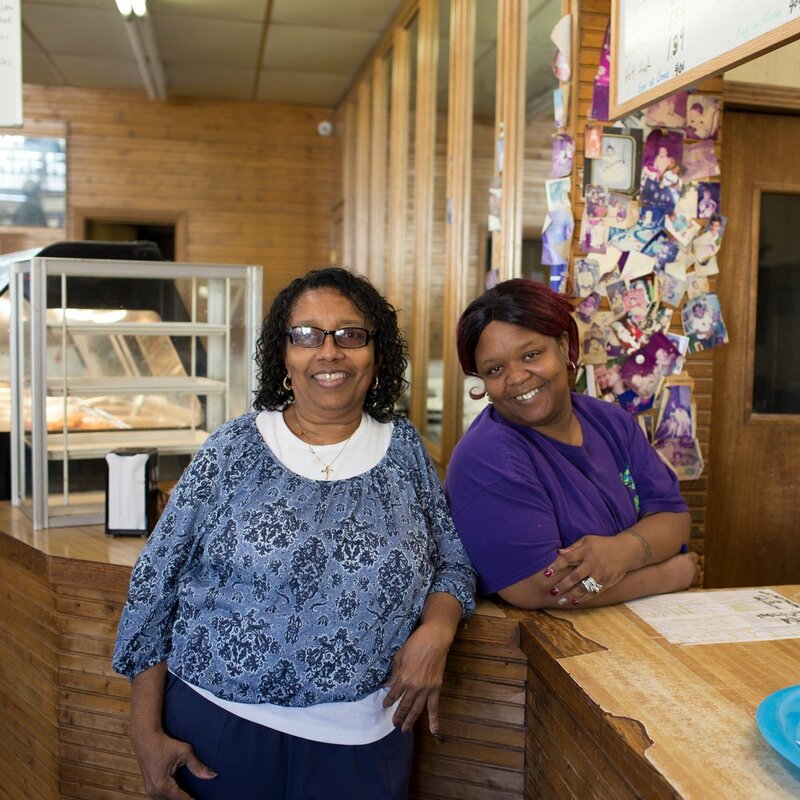 Angie and Shirley both cook, and Verdie used to, but now she runs the store. They serve a hot lunch Monday through Friday, including barbecue, fried chicken, greens, corn, and lima beans. Breakfast is every day except Sunday, and the whole meal revolves around biscuits: sausage biscuits, ham biscuits, baloney biscuits. Fifteen years ago they baked 2,000 biscuits a day; now Angie estimates it’s around 1,000, and they still sell out almost every day. Angie grew up in Grenada and worked as a Certified Nursing Assistant before starting at the Biscuit Pit. She learned to cook from her mother, who made garden greens, peas, and biscuits. I ask Angie if the food here is like her mom’s. She says the greens at the Biscuit Pit come from a can, but the biscuits are pretty much the same. Although Angie used to make biscuits here, these days she mostly cooks savory food and bakes apple and peach pies once a week. Angie’s hair is streaked red, and she has tattoos on her left wrist. She fiddles with a giant ring on the fourth finger of her left hand. When I ask her to write her name, she giggles. “I keep forgetting my last name! I just got married.” When I photograph her later, the ring shines front and center. People who walk into the store wave at Angie and Verdie, and even Shirley, who is cooking behind a counter. 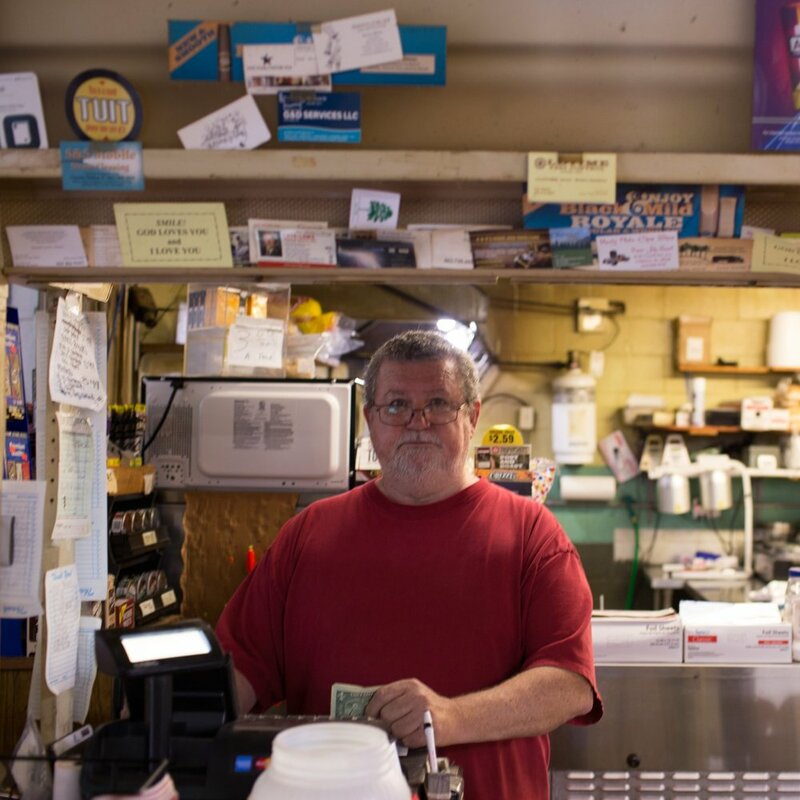 One middle-aged man in a baseball cap seems perturbed that Angie isn’t waiting on him and yells – jokingly, I think – “the customer is always right!” Angie says she knows just about everyone who comes in here; they are mostly locals, and mostly older men. They have all been coming to the Biscuit Pit for a long time. Some of the same people who come for breakfast come back a few hours later for lunch, and they might even come back in the evening, just to drink coffee. They talk politics and town gossip. New ones start coming every now and then, and some older ones pass away. She names Mr. Wayne Carson, the school principal, and Jimmy Blakely, who was “real funny.” There was Mr. Wade and Mrs. Mims, mother of Brent Mims, who owns the store. Charles used to walk here from his house, and he just died last year. “I miss him talking,” she says, her voice trailing off. After Angie goes back to work, I stay for lunch: collard greens and cornbread. Verdie hovers around my table, sweeping, telling me about her daughter in Atlanta. Shirley first ignores my camera when I start making photos, then pauses her cooking to tell me about a collage of photos tacked to the wall by the kitchen, which are faded and curled at the edges. They are all pictures of locals and regulars – at high school proms and weddings and baby-faced in pre-school portraits – many of whom are now grown. She takes care to point out her granddaughter among them. A man and a woman sit at a table at Dunn’s Country Store, he unwrapping a biscuit sandwich and she sitting quietly. Fox News plays on a television screen in the corner of the room, above an empty salad bar where a sign reads, Help us control cost! Our salad bar is one trip. Next to them is a table of four men, all clad in camouflage, talking in low voices with their legs outstretched. Gene Dunn greets the couple by name. “I’m not eating because I’m having a colonoscopy,” the woman says.” Gene nods, his eyes peering over the tops of his thin glasses. Like Angie at the Biscuit Pit, Gene knows the majority of people personally who come to Dunn’s, his namesake store; in fact, he says, “Most of them I consider friends.” The store sits a ten-minute drive from downtown Water Valley on a sleepy highway, next to the Sylva Rena Baptist Church. The gas pumps still work, and a sign out front bills the store as a “Grocery and Bait Shop,” but locals know to visit Dunn’s for the burgers and barbecue. Gene was born just five miles from the store, and he’s spent most of his life here. He worked in various management jobs at Pizza Hut, Shoney’s, and Fred’s before buying his own store twenty years ago in Paris, Mississippi. “I like to be the one that’s in charge,” he explains. Several years later, after a brief stint owning a Water Valley steakhouse, he bought this one. Gene looks to be in his early fifties, with gray curly hair and a matching goatee, and he speaks with a thick Mississippi accent. He drives a school bus of four-year-olds every morning and afternoon to pay his insurance, and in between he’s here, paying bills, cooking barbecue, and talking to customers. Just outside the entrance is a small room with a stained refrigerator and a giant tub of water, filled with live minnows for fishing bait. Inside, a cash register counter faces rows of condiments and cleaning supplies. 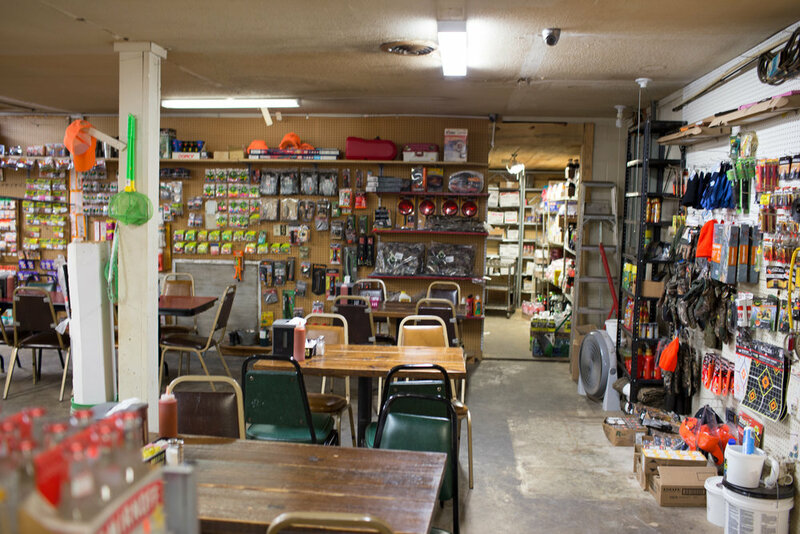 At the end of the aisles the space opens up into a dining area dotted with several tables and walls covered with hunting gloves, batteries, turkey calls, and rubber boots. Most of the tables seat four or six; they are communal by design, intended to bring strangers together. Dunn’s serves breakfast, lunch, and dinner, and some regulars come daily – even twice a day. There’s no alcohol (only hot beer) and they close at 8 p.m. People tend to linger, especially in the mornings, to catch up with the local news, find out who’s catching crappie at Lake Enid, and who scored a buck during deer season. As Gene tells me about the regulars, I look over at the four camouflaged men around the table. Their conversation is sporadic; they sip coffee occasionally and do not look to be in a hurry. Gene is the cook in his family. He remembers sitting on the kitchen counter as a kid and watching his mom and grandmother cook homemade biscuits, fried chicken, pot roast, and meatloaf. They raised a garden and cooked fresh vegetables. Those experiences inspired the country cooking at Dunn’s. I point to cake slices on the counter, covered in pink frosting and protected with plastic wrap. I ask if they bake the cakes in house, and Gene shakes his head, indicating they bought it from someone locally. The biscuits, too, they buy frozen, although they have at other times made them from scratch. Gene doesn’t elaborate, but I can’t help contrast his talk of country cooking with the frozen biscuits and deli meats I see up front. I begin to understand that Gene is no purist, but for him, that doesn’t change what Dunn’s is all about: small-town values. Water Valley is changing. When Dunn’s first opened, the clientele was primarily an older crowd, and hunting and fishing were big businesses. Today, younger people have moved in and business has picked up in town, pressuring Gene to stay open a little bit later on the weekends. On my way out, I ask Gene about the napkin holders on his tables. Each has a photo slipped inside the plastic cover; one is a young woman, her hair flying, printed in black and white. He tells me they are all people in the community who come to Dunn’s, and who brought photos of themselves to display here. Like it’s their own living room, I think. Who knew Oxford’s best barbecue was in a gas station? I’ve heard the ad on the radio dozens of times since moving to Oxford last summer. Maybe it got me thinking about this project to begin with. 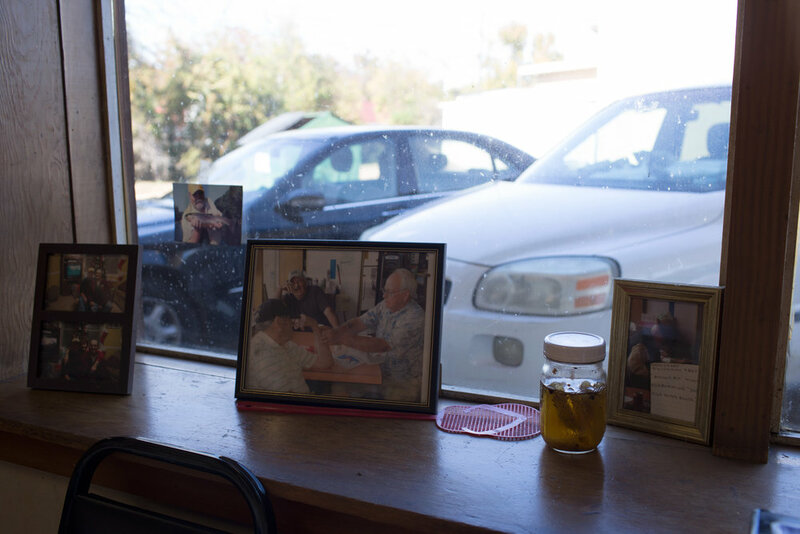 It seemed like the gas station part was a source of pride, or a well-kept town secret – a differentiator among the other barbecue restaurants in town. Who knew? 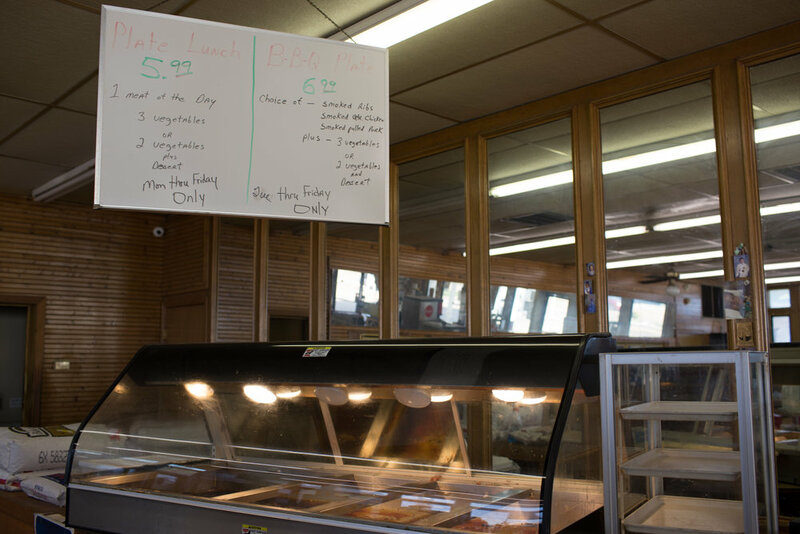 The space that houses B’s Hickory Smoke BBQ is actually three businesses in one: a Shell gas station, the Skymart Grocery and Bait Shop, and B’s. 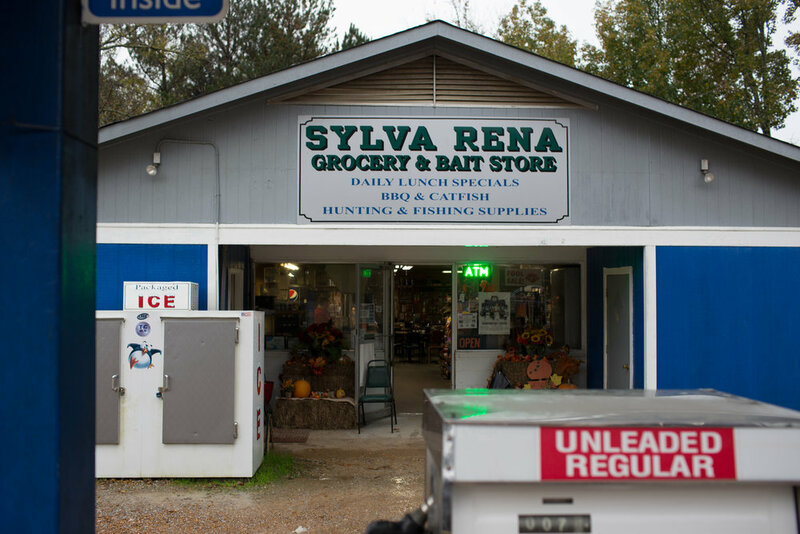 Skymart has for years been a one-stop shop for groceries, paper goods, and toiletries, along with live bait and an entire aisle of fishing rods. Walk to the end of the shop and you’ll step into B’s, where a smattering of small tables leads to a hot buffet that spans the length of the store. Brisket, pulled pork, and fried chicken sit next to cornbread, lima beans, and green beans. Two giant pots simmer on the stove behind the counter, where three employees take orders and dish up plates heaped high. “Where’s my commode?” Conway Moore calls from behind the counter. She’s addressing a long-haired man in a baseball cap who has just finished eating and rises from his table. He laughs and says he’s working on it, and she laughs, too. I assume he works in home appliances, but I don’t ask. Conway is new to B’s. She grew up on a farm in Waterford, about twenty miles from Oxford. (“We were very country, honey,” she says.) Her blonde hair is cropped close to her head, and she wears glasses and a blue apron. After twenty-five years working as the zoning and building director for Marshall County in nearby Holly Springs, she decided she was ready for something new. She started working here in October of this year, when her sons Jim and David Moore, who also own the Blind Pig in Oxford, bought the place. A team of long-time B’s employees showed her how to make the recipes, and now they all share cooking responsibilities. Breakfast is scrambled eggs, sausage, bacon, biscuits, hash browns, and toast if you ask for it, or if the staff recognizes you. “Our customers come in and soon as they hit that door, our girls go, ‘He wants toast!’ They immediately start his toast.” Conway smiles and looks proud. Lunch and dinner – or dinner and supper, as Conway calls them – is all about barbecue, chicken tenders, and sides, including vegetables, coleslaw, and potato salad. Each day offers a different special, like pork steak day on Monday. Thursday is the most popular day, Conway says. That’s hamburger steak day. “You know, people drive out here just to get the Kool-Aid!” Conway tells me. “What’s so special about it?” I ask. Oxford is a bigger town than Grenada or Water Valley, and the crowd at B’s reflects that. They see the working crowd, the retired crowd, and people who find them by searching “barbecue” on Google. They also feed Ole Miss football and basketball teams, teachers, and plenty of tailgaters. Recently they even cooked barbecue for a wedding reception. Still, regulars come in every day. The staff knows them by name, and the customers know their birthdays. When I ask Conway how long B’s has been around, she calls her colleague Jennifer over to answer. As a B’s cook of fourteen years, Jennifer has seen a lot of familiar faces. She is shy and soft-spoken, full of “yes ma’ams” for both Conway and me, and looks to be in her early forties. Jennifer tells us that B’s started in Holly Springs, then moved to Pontotoc and Batesville and another location in Oxford, but she estimates it’s been around for about twenty-five years in total. She started working here when her son, Brandon, was as tall as her knees, and she used to bring him and his brother to work. When she talks about her sons, she smiles. 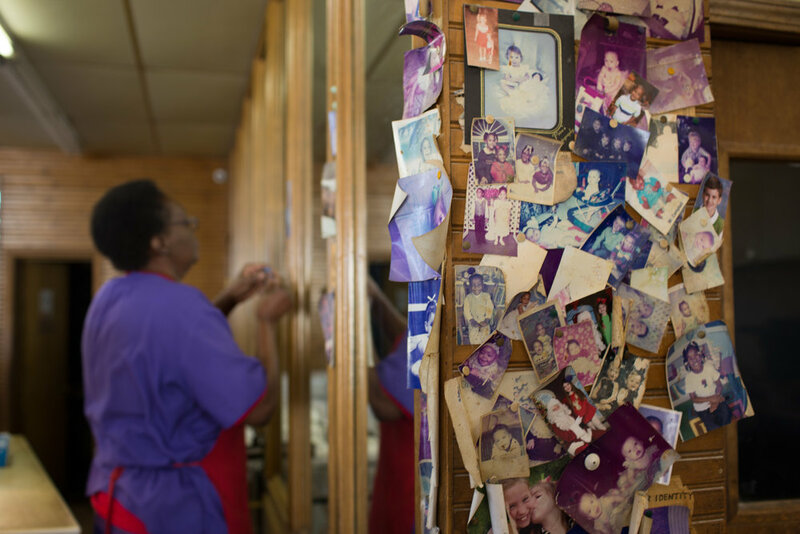 At the Biscuit Pit, Dunn’s, and B’s, food is inextricably tied to people and place. The cooks prepare recipes influenced by their families and childhood, always with their present-day community in mind; in turn, those communities shape the culture and life of the spaces. Reciprocity is central to the success of each one, and each space is unique to its community. However, my fieldwork uncovers a few themes that resonate through each store. First, employees exhibit pride in doing things the old way. Angie tells me her biscuits are special because they are “made with love.” Gene idolizes the food his mom cooked, and Conway prizes “country cooking” from scratch. Tradition and comfort bind the food, people, and atmosphere these spaces foster. No one spoke of innovation or technology; when they do rely on shortcuts – whether the canned greens at the Biscuit Pit, or the frozen biscuits at Dunn’s – they don’t advertise it. Said differently, the appearance of tradition may be more important than the reality. Next, these are places where people come to be known. All boast regular customers, with some who visit the stores two or three times per day. Angie’s description of the memory cups illustrates people’s desire to be seen and recognized, and perhaps their fear of being forgotten. The cooks and employees address regulars by name, and may even count them as friends. They provide a sense of community and comfort for those who may not have one otherwise. In some cases, knowing customers is a business strategy; Gene admits it’s essential to have regulars to succeed in the business. In other cases, it’s how employees bring meaning to their daily work. Angie and Jennifer say they have stayed in their jobs for more than a decade because of “the people.” Perhaps knowing guests, and being known, provides a sense of purpose beyond a paycheck. Finally, these sentiments represent a reaction to a changing world, where families often live far apart; food is expensive, and frequently mass-produced; and opportunities to interact with neighbors may be increasingly few and far between. 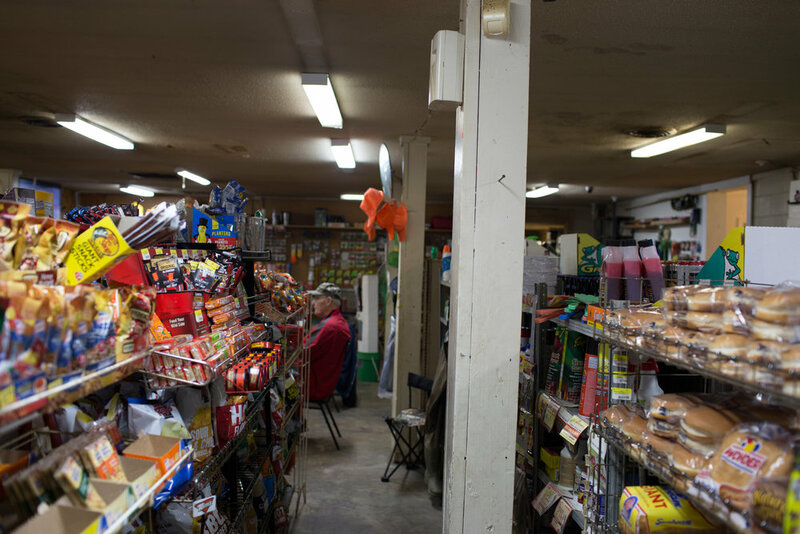 In such a climate, Mississippi convenience stores provide traditional home cooking, small-town values, and a sense of belonging – where your presence or absence matters. They offer reminders of a nostalgic, rural lifestyle in the face of modernity and globalization, easing anxieties of people who may feel left behind. Alford, Emily. “How Gas Stations Became Food Meccas in the South.” Thrillist, 3 Feb. 2017, https://www.thrillist.com/eat/nation/the-south-best-gas-station-food. Accessed 30 Nov. 2018. Clark, Thomas Dionysius. Pills, Petticoats, and Plows: The Southern Country Store. Bobbs-Merrill Company, 1944. Medley, Kate. “Meat and Three & Ten Dollars’ Worth of Regular.” The Bitter Southerner, http://bittersoutherner.com/meat-and-three-and-ten-dollars-worth-of-regular. Accessed 16 Oct. 2018. Mills, Jerry Leath. “Store Lunch.” Southern Cultures, vol. 4, no. 1, 1998, pp. 149-150. Williams-Forson, Psyche. Building Houses Out of Chicken Legs: Black Women, Food, & Power. University of North Carolina Press, 2006.